I’m a rule follower, excellent at following directions and getting things done on time, but I’ve always admired people that take a different path – who have minds so creative, ingenious and unafraid that they feel comfortable completely departing from the norm to create something new. I think the best projects take a combination of rule followers and dreamers to be successful. In Going Places, Rafael is just like me. He is so excited when his class receives go-cart kits. All the students are to build the kit and then have a race. Rafael goes home and builds the kit, following the directions to the letter. His go-cart looks exactly like the picture. He decides to check on his friend and next door neighbor, Maya to see how she is progressing. He sees her sitting in her yard staring at a bird on a tree and then at a bird flying. When she builds her go cart, it doesn’t look at all like the picture on the kit. It looks more like an awkward flying machine. When Rafael asks Maya why she didn’t building a go-cart, she says that no one said she had to build a go-cart. Rafael sees where Maya is going with her project and asks if they can team up. Nothing in the rules says that they can’t team up. This is a wonderful book that makes you cheer for all your dreamers and the rule followers can spot a great idea and help bring it to reality. Grouch, Grump and little Gloom ‘n’ Doom are monsters. They each think they are biggest, baddest monster. They spend their time arguing and trying to best each other. Then, they decide to settle their argument with tape, gunk, glue and a lightning bolt. The monster they create will be truly horrible and will scare everyone in the monster-fearing village just down the hill from their castle. What a surprise when their terrible, giant monster doesn’t realize that he’s a monster. His first words are “Dank you!” He then proceeds to greet all the bats, snakes and other creatures in the room – much to Grouch, Grump and little Gloom ‘n’ Doom’s chagrin. 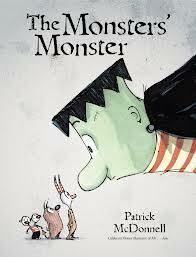 This is a funny, sweet book that my students loved. Enjoy. Journey is beautifully illustrated wordless book and uses color very effectively to tell a story of a good deed and its reward. 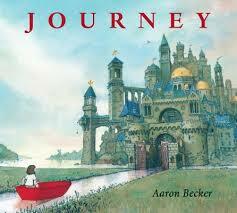 As I paged through the book for my classes, I could hear my students whispering the story to themselves. Their spontaneous applause when I finished the book matched my feelings exactly. I love this book so much that I’ve shown it to countless adults since first reading it. A lonely girl takes her red crayon and draws a door in her bedroom wall. The door leads her into a beautiful forest filled with lanterns and lights. There she finds a small stream. She draws herself a boat and follows the stream to a beautiful city. The city could be from medieval times with its stone walls and golden domes. She floats through a city canal. When she comes to the end of the canal, the girl draws herself a hot air balloon. She flies away and sees a purple bird flying away from city soldiers. When the soldiers catch the bird and place it in a cage, the girl steals the bird’s cage and frees the bird. Caught by the soldiers herself, the girl is suspended in her own cage. The grateful bird brings her a crayon so that she can draw herself a magic carpet. The girl follows the bird until she finds a door. When she opens the door…well, you’ll have to read Journey and find out what happens. This is a book you won’t want to miss and that you and the children you read to are bound to read over and over again. When I moved from New York State to California 30 years ago, I knew that I would give up the seasons and wouldn’t see snow day to day in winter. Honestly, the latter didn’t bother so much after years of slipping on ice and digging out driveways. Many of my students rarely, if ever, have the chance to see and play in the snow. They know that it’s cold in winter, that some trees lose their leaves, that bears hibernate and that children make snowmen and snow angels in the snow. I love to share winter memories from my childhood in upstate New York, building snow forts with my big brother, making snowmen and throwing snowballs. Whether your children or students live in a climate where they know winter well, or whether they only can wonder what it’s like, Snowmen at Night is a great book for a winter read aloud. 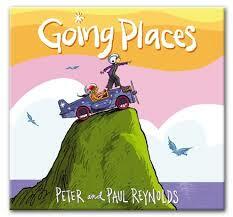 The rhyming text is easy to read and the pictures by Mark Buehner are so engaging. 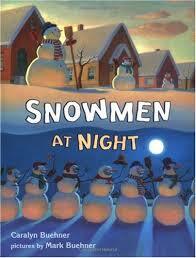 This is a fun book about the secret life of snowmen that delighted my kindergartners. I hope you have fun with it, too. 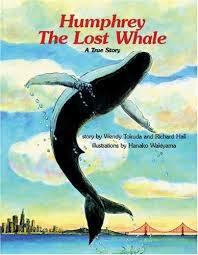 I was drawn to this book because of Eric Carle’s illustrations. 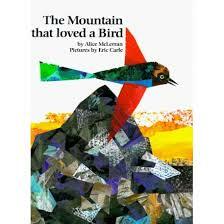 As I read The Mountain that Loved a Bird, I really fell in love with it, as did my students. It’s a book filled with longing, friendship and dedication. Joy is a bird that lands on the side of a mountain. The mountain is lonely. When it hears Joy’s beautiful singing it asks her to stay. Joy says that she can not stay, because there is no food or water for her on the mountain. She says that she’ll return every year to visit and sing to the mountain. She also says that she’ll name her daughter Joy and her daughter will name her daughter Joy so that every year bird named Joy will visit the mountain to sing to it. Each year, Joy returns and each year, the mountain begs Joy to leave and is sad when it’s time for Joy to leave. One year, the mountain is so sad that it cries, and a stream of tears starts running down the mountain. The next year, Joy brings a seed with her and drops it near the stream. Over the course of years, the seed grows roots and draws water from the cracks deep within the mountain. Soon, more plants grow, and the mountain’s tears of sadness grow into tears of happiness at everything growing around the mountain. The book closes with Joy bringing a twig to begin her nest on the mountain. She tells the mountain, finally, that she is there to stay. This is such a beautiful book. I hope you enjoy it.